We don't really eat a lot of beef in my household, but here lately I've been wanting the feeling of being super satisfied after a meal. I'm talking that good ol' STUFFED feeling. So I figured some form of beef/steak would probably hit that spot. So I found this recipe for a beef stir fry online and gave it a go. No, your eyes are not fooling you--I'd completely forgotten to add the mushrooms, which as you can see by the recipe is a big part of the dish (4 cups!). I think I was so busy feeling so much like an Iron Chef whipping stuff up in my wok, that I'd just completely forgotten about them. Needless to say, it still taste great. I figure the mushrooms really just add volume, which means more food that can last over more days. I won't forget next time, believe that! 1. 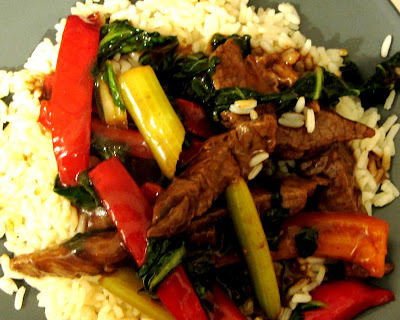 Slice beef into very thin strips. 2. Mix cornstarch, broth, soy and sugar until smooth. Set aside. 3. Heat 1 tablespoon oil in saucepot or wok over high heat. 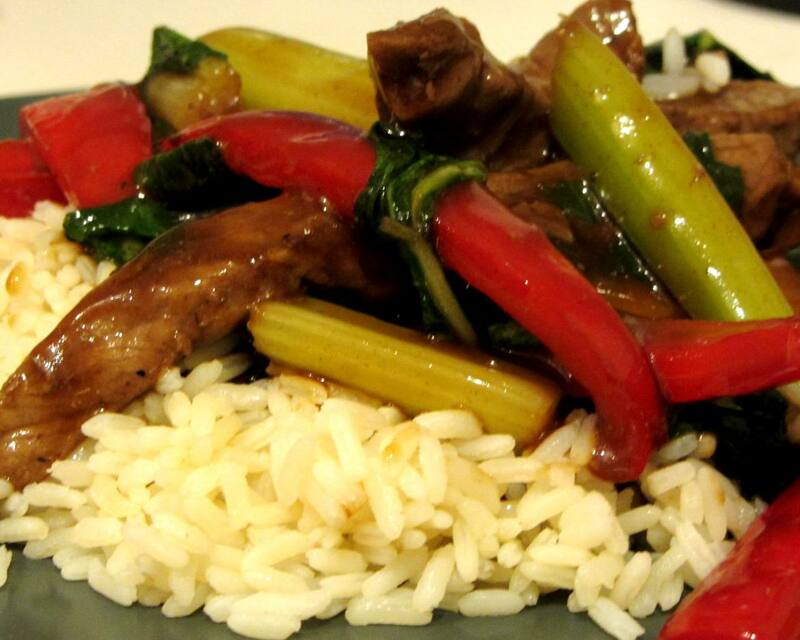 Add beef in 2 batches and stir-fry until browned. Set beef aside. 4. Add 1 tablespoon oil. Add the mushrooms, cabbage, peppers, celery and green onions in 2 batches and stir-fry over medium heat until tender-crisp. Set vegetables aside. 5. Stir cornstarch mixture and add. Cook until mixture boils and thickens, stirring constantly. Return beef and vegetables to saucepot and heat through. Serve over rice. -As you can see, it's still quite tasty with or without mushrooms, so if you're not a mushroom person, feel free to leave them out or reduce the quantity. -I seasoned the beef with a little seasoned salt and garlic powder after I'd sliced it up and let it sit in the fridge for a couple hours before cooking. -I also added a clove of minced garlic to the sauce ingredients. mmmm, that looks soooo yummy!! Wow that looks tasty ! I def need to try. Thank you for sharing the recipe step by step clearly. That looks good! I think I'll give that a try tonight. I made it last night. It was so good! I omitted the mushrooms because we don't care for it I also didn't put as much sugar. I'm so excited that you guys are enjoying the recipes I' post! Thx! Also, the leftovers of this dish (if you have any) taste even better. The flavors get to marinate into the meat even more! yummm! that looks so good.